Personnel from each agency can go to an online website to quickly ascertain property ownership and update information about their agency's property assets. 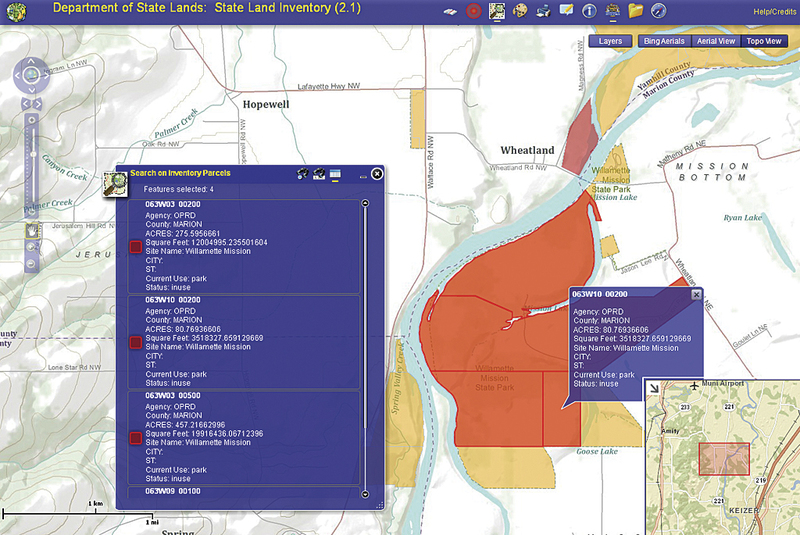 Editor’s note: Staff from each of the state agencies responsible for managing Oregon’s real property holdings can now determine property ownership and update their own records using a web application created by the Oregon Department of State Lands (DSL). 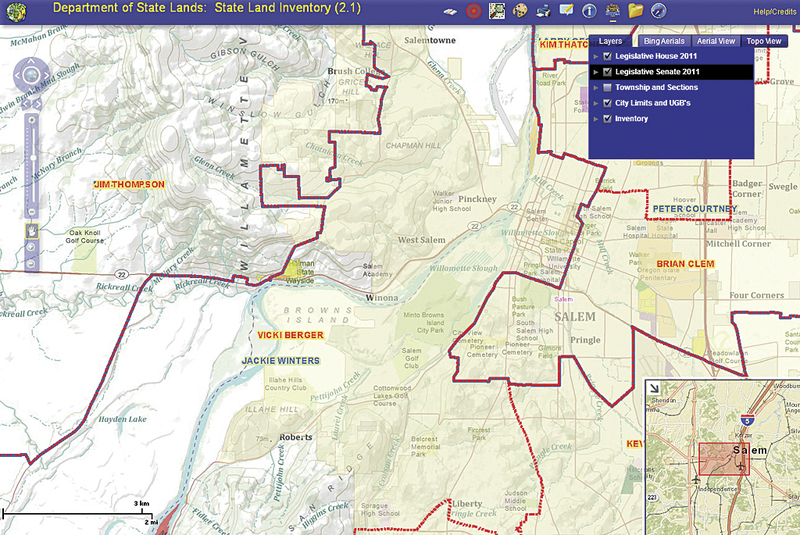 In early 2004, the Real Property Service section, part of the Enterprise Asset Management division of the Oregon Department of Administrative Services (DAS), was tasked with developing a graphic and comprehensive inventory of state-owned lands that would be accessible to members of the governor’s office, legislature, state agencies, and the public. DAS has the statutory responsibility, per Oregon Revised Statutes (ORS) 270.180 and 276.227, to maintain a current statewide lands inventory. What DAS needed was an online web-based geospatial database that would allow members to conveniently ascertain information about state-owned land. DAS initially hired The Gartrell Group, a consulting firm and Esri partner, to determine the feasibility of this endeavor and come up with a cost estimate for accomplishing it. At the same time, DSL had developed a comprehensive, statewide mineral rights ownership geospatial layer utilizing Esri technology (e.g., ArcInfo, ArcIMS, ArcSDE, ArcGIS). DSL is responsible (per ORS 273.790 and 273.099) for maintaining records of all subsurface minerals rights on state-owned lands. Since DSL had experience working with both ArcIMS web technology and ArcGIS for Server 9.3, both DSL and DAS determined that the best approach would be to utilize something based on ArcGIS 10 for Server. 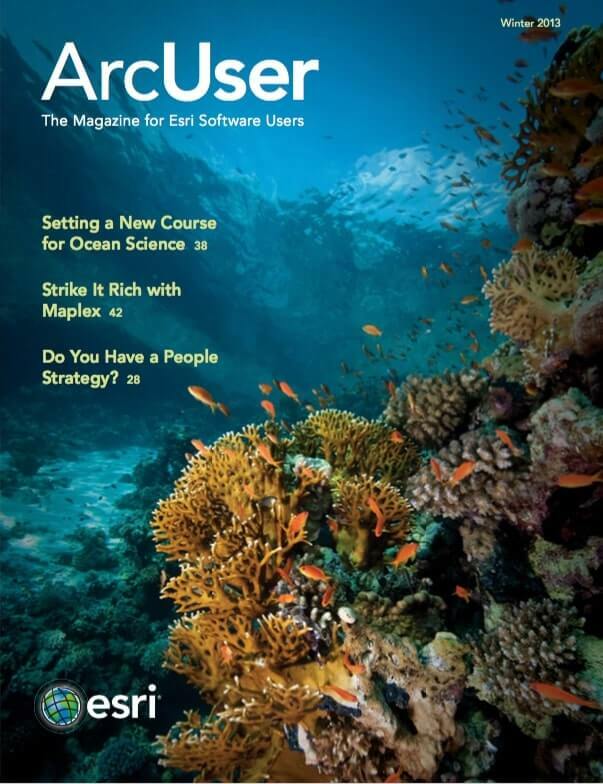 While ArcIMS had gotten the agency started using GIS on the web, that technology had become dated and didn’t meet the agency’s requirement for a contemporary ArcGIS enterprise environment. The application incorporates agency and legislative district boundary information. Because the Flex environment is more mature, it was selected over the others. The first step in utilizing the ArcGIS Viewer 2.1 for Flex was to download the uncompiled source code for the ArcGIS Viewer from the Esri website and import it into Flash Builder 4.0. Though Esri provides both uncompiled and compiled versions, creating customized applications with an API requires uncompiled source code and some programming knowledge. Editing in the ArcGIS 10 for Server and Flex ArcGIS viewer environment is accomplished via feature services (i.e., map services with feature access), which create REST endpoints that are then referenced in the application. The feature services are accessible to the web API via a feature layer, where the attributes and geometry are actually edited. The features reside in an ArcSDE geodatabase. Similar to editing in ArcGIS for Desktop in a multiple user environment, if modifications are made by two or more users at the same time, the last edits in are committed to the ArcSDE geodatabase. Typically in an ArcGIS editing session, the user can edit not only spatial features but also feature attributes. In the past, each of the six state agencies that manage state lands had to keep track of the state’s property assets. This was accomplished using a variety of tools and data formats. Data was then sent to DSL for record retention. The State Land Inventory site application brings the work of all these agencies together. Now each agency uses the same tools and data format. It is easy to search on inventory parcels. When working with proprietary datasets that have restrictions, all editing should require that users be assigned privileges and recognized through special authentication. This is especially true when editing datasets online in web browsers. The base Edit widget was modified to allow online editing through an authenticated approach. The user first authenticates into the system, which starts a selection process similar to that used in ArcGIS for Desktop. This ensures that only authorized personnel can modify their agency’s records in feature layer attribute tables. 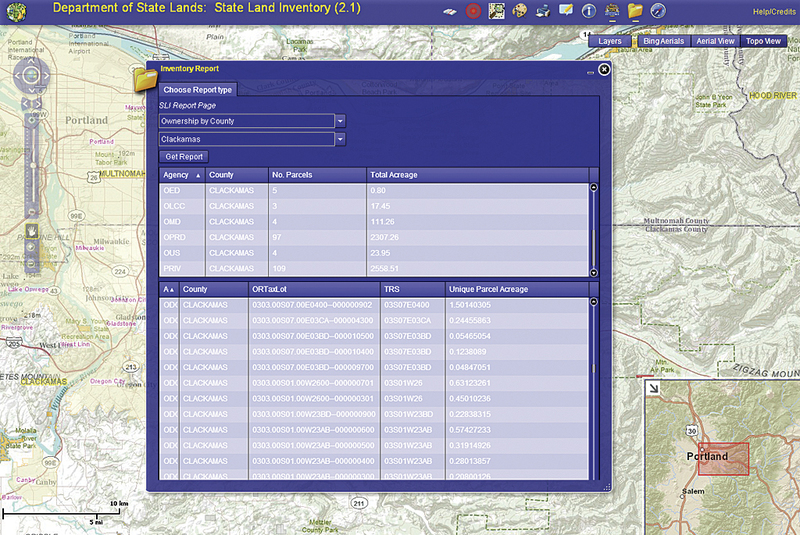 The State Land Inventory application facilitates online editing through an authenticated approach so users can only edit data from their agency. This eliminates any chance that changes could be implemented by unauthorized personnel. Personnel from each agency can log in to the online application and make real-time edits to geospatial layer attributes in an easy-to-use web-based environment. This increases efficiency by eliminating involvement of specialized personnel trained in GIS in the workflow and reducing overall staffing cost. Several agencies wanted the application to generate online agency reports of surface ownership derived from queries against attribute tables for multiple layers. This is easily done by selecting the appropriate type of report desired and clicking the Get Report button. This runs a number of queries against an attribute field, and the results are displayed on the same screen near the bottom of the scrollable and resizable window. These results are helpful because queries are run against both agency boundaries and legislative districts throughout Oregon. The application fulfills the desire of state agencies for reports of surface ownership derived from queries against attribute tables for multiple layers. Overall, the value of this application to the state is that individual agency personnel can simply go to an online website and quickly ascertain who owns real property in the state and make updates to information about property assets managed by their agency. 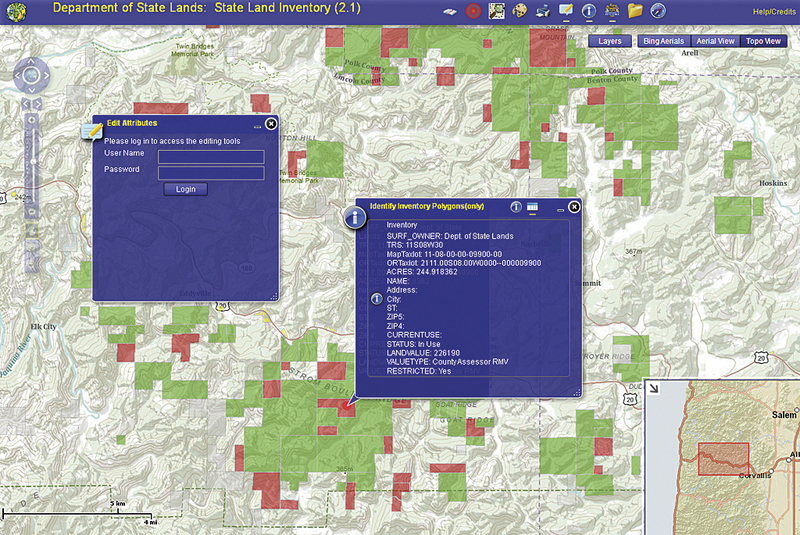 The State Land Inventory site also reduces the need for dedicated software licenses and staff trained in GIS. Esri has done a great job creating APIs that can be used to create efficient web-based GIS applications that provide an alternative to desktop GIS and further the movement of GIS to the cloud environment. DSL was able to organize the data, create the application, and get it up and running in just a few months. This resulted in a major cost savings for all stakeholders. The application will continue to evolve with the technology. View the current version. The author thanks members of Esri’s Technical/Professional Support Services for their advice and input into the project; Eric Andersen, IT manager at the Department of State Lands; and the many people at the State of Oregon who helped make this effort possible. Randy Sounhein has a master's degree in environmental science from Washington State University, a bachelor's degree in geology from Central Washington University, and more than 22 years of hands-on experience with geospatial technologies and Esri products. He worked as a senior groundwater quality/GIS analyst for the State of Idaho from 1990 to 1997. He is currently the GIS coordinator for the Oregon Department of State Lands in Salem, Oregon. He can be reached at randy.sounhein@state.or.us.